The Irrigation Calculator provides broad guidance for water requirements of commercial crops produced in Western Australia. Average weather data from the past 25 years (1990-2014) has been used to calculate ‘effective evaporation’ and allowance should be made for years that are hotter, drier, cooler or wetter than average. Allowance should also be made for extra water required for frost control, preventing erosion and sandblasting, cooling a crop or applying nutrients through irrigation as these are different for each farm. Registration and creation a a user account will allow previous calculations to be stored. 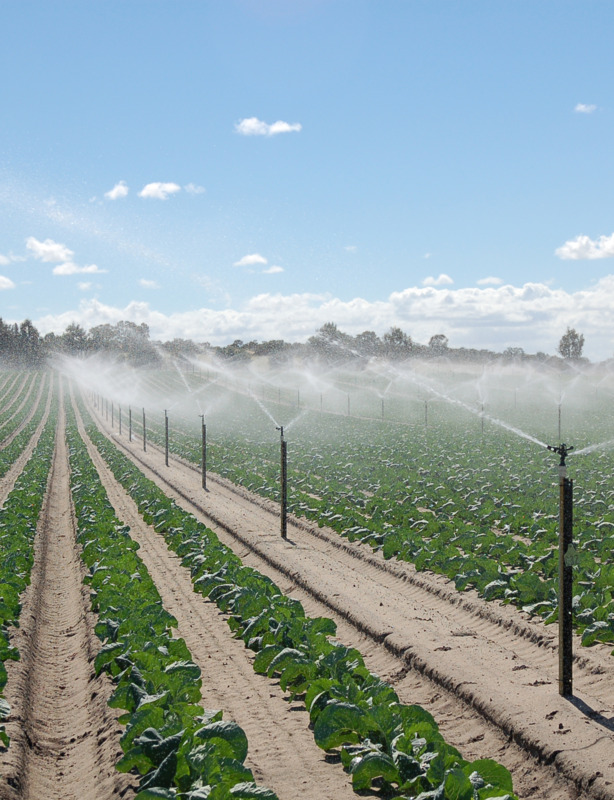 The Irrigation Calculator provides broad guidance for water budgeting on commonly grown commercial crops in Western Australia. It should not be used for detailed farm irrigation scheduling. Average weather data has been used to calculate water requirement for crops. Allowance needs to be made for years that are hotter, drier, cooler or wetter. The program calculates the crop water requirement to produce commercial crops. It does not take into account extra water required for frost control, preventing erosion and sandblasting, cooling a crop or applying nutrients through irrigation, in addition to watering requirement. These activities as well as other farm uses of water (i.e. washing produce, packing sheds and winery operations) should be calculated separately and considered when planning water needs. Use the Open map to select location tab or select a region and then location using the drop down menu’s to find a weather station closest to your farm. Using the Soil type drop down tab, select either the Coarse sand or the Clay/Loam tab. Coarse sand is most appropriate for the majority of the coarse sands of the Swan Coastal Plain. Choose a Crop you are growing in the Crop drop down tab. For annual crops a Planting month and Started irrigation month tab will appear. Select the approximate planting date and start month of irrigation if different to planting. For perennials there is no need to add a planting date. Press Submit for your result. A summary of the scenario including planting date, location, water required per area and hectare is displayed and able to be printed. Previous calculations for your current session will be saved and can be edited or printed. If you are a registered user, previous calculation will be saved and can be edited or reprinted. Evaporation and rainfall has been calculated for each month using data for the past 25 years (1990 to 2014) from Scientific Information for Land Owners SILO weather data service. SILO is an enhanced climate database hosted by the Science Delivery Division of the Department of Science, Information Technology and Innovation (DSITI). To select the most accurate data for your farm, first select the region and then the nearest station to you. Effective daily evaporation takes into account the evaporation, rainfall and storage capacity of soil to estimate the water required in addition to rainfall, to supply crop demand. The following rules have been applied to rainfall when calculating effective daily evaporation. In January, February, March, November and December, rain events greater than 4 mm but not including the first 4 mm are considered effective. In April, May, September and October, rain events greater than 3 mm but not including the first 3 mm are considered effective. In June, July and August, rain events greater than 2mm but not including the first 2 mm are considered effective. Example: April at the Perth metro weather station. Over the past 25 years there has been an average of 2.9 days where rain greater than 3mm has fallen. These events average 11.7mm, so 8.7mm when the first 3mm is subtracted. Average evaporation over April is 133.4mm over 30 days. Different soil types have different capacities to store water. Loams and loamy clays hold more water, drain slower and have lower surface evaporation losses than coarse sandy soils on the swan coastal plain. This affects the amount of rainfall that is considered effective, as rainfall beyond the holding capacity of the soil and root zone of the crop is not available for use by plants (ie: it drains away). The following assumptions have been made when considering rainfall. When rainfall is greater than average daily evaporation, no more than 6mm is considered to be stored in sand. When daily effective rainfall is greater than daily evaporation, no more than 20mm is considered to be stored in loam/clay soils. Therefore in coarse sand, it is assumed that rainfall will only reduce plant irrigation water requirement by a maximum of 6mm on any rainy day. In loams and soil with higher levels of clay than coarse sand, rainfall will only reduce plant irrigation water requirement by a maximum of 20mm on any rainy day. While these rules will not give you absolute water requirements for your crops, the range in volumes of water required between sand and clay loams should be representative of crop requirements. An annual plant usually germinates, flowers, and dies in one year or season. Examples include vegetables, some pastures, wheat and lupins. True annuals will only live longer than a year if they are prevented from setting seed. A perennial plant is a plant that lives for more than a year. Fruit trees, lucerne and some other pasture species are perennial. Where an irrigation system wets 100% of the area, usually by overhead sprinklers in vegetable crops or under tree sprinklers in perennial crops, the irrigated proportion is 1. For some drip irrigated crops like melon and pumpkin, the ground area being irrigated may only be half the area but the canopy of the crops at maturity is extensive and will be close to full coverage. In this case a proportion of 1 should also be used. When the area wet by irrigation is less than 100%, the area of canopy coverage should be used to estimate the reduction in water requirement. For example, if a mature citrus orchard, irrigated by drip irrigation, has tree canopy occupying 70% of the ground area, the irrigated proportion is 0.7. For strawberries that are grown under plastic mulch with drip irrigation, the wetted area is only as wide as the bed. The irrigation proportion should be based on how much bed area is covered by the canopy of the crop at maturity. Depending on spacing and vigor, this may be close to 1. When this approach is used, the bed area only, not including the wheel tracks, needs to be entered into the area planted tab. If a bed is 1.2 metres across its top and bed centres are spaced at 1.4m, there is only 1.2m / 1.4m = 0.86 ha of bed area per full ha of area used. In this case 0.86ha would be added into the area planted tab. Trellised crops should use the effective area of shade (EAS) method (Goodwin, I. and O’Connell, M. 2004) to work out the irrigated area. EAS is determined from measurements of the percent shade cast by the trees or vines at three key times a day (3½ hours before solar noon, at solar noon and 3½ hours after solar noon). Taking three measurements per day accounts for changes in the percent shade during the day due to sun angle, foliage extent (i.e. training system and tree/vine size), planting arrangement (i.e. row orientation and tree spacing) and leaf area density. EAS is calculated from the average of the three measurements. A gap fraction is estimated from the percentage of light shining through the area shaded by the trees. 0 would be no shade and 1 would be full shade. Example: An orchard has trees spaced at 5m. The percent shade measurements are made at 3½ hours before solar noon, at solar noon and 3½ hours after solar noon. Yearly assessments may need to be made as the crop matures. When calculating water required for licences you should factor in fully mature tree sizes which depending on training and spacing may cover between 50% and 100% of the area being calculated. The program calculates an estimate of the total water required to produce a crop. As no irrigation system delivers water with 100% uniformity, an inefficiency factor is applied to calculate the extra water needed to adjust for the delivery efficiency of different systems. The inefficiency factor of your system can be calculated by carrying out a uniformity test and calculating the distribution uniformity (DU) or emission uniformity (EU). The minimum standards for irrigation uniformity are distribution uniformity (DU) of greater than 75% and a coefficient of uniformity (CU) of greater than 85%. Ideally uniformities should be higher to minimise the extra water required to compensate for inefficient application of irrigation water. While poor irrigation practice should not be a reason for a higher water allocations, it needs to be accounted for when budgeting irrigation and water storage requirement. Improvements to irrigation should be made to achieve a high efficiency of irrigation. Table 1 shows the inefficiency factor and extra minutes run time required per hour of irrigation for different DU’s. A standard 1.1 has been used as a default in the irrigation calculator. This can be adjusted based on irrigation performance testing. Table 1: Conversion of DU to inefficiency factors and extra minutes required to bring the lowest quarter of area up to average application. Water requirements have been estimated for annual crops taking into account the different stages of plant growth described by Doorenbos and Pruitt (1977). late growth stage: from end of mid-growth stage until full maturity or harvest. Where further research has been done, more stages of growth may have been used. Crop duration (growing period) is based upon the number of days from planting of a transplant or seed to harvest. Crop duration changes for each month of the year and for different regions of Western Australia. The crop factor is the proportion of evaporation that must be replaced with irrigation for a crop to produce a commercial yield. For most crops, crop factors increase as crop stage increases. For some crops (e.g. potatoes), crop factors reduce as the plants approach senescence or harvest. The proportion of time in each of the growth stages was estimated from data published for crops grown under a wide range of conditions by Doorenbos and Pruitt (1977). Although the published data could not be directly applied to Western Australia, it was noted that for any particular crop, regardless of the area or season in which it was grown, the number of days in each growth stage was a similar proportion of the total time from planting to harvest. Data was developed by applying these proportions to the time taken from planting to harvest for the crops planted at different times of the year throughout Western Australia. Where data was missing, DAFWA staff contributed information on crop growing time when planted throughout the year. Crop factors for most perennial crops vary for the stage of growth, maturity and leaf cover at different times of the year. All crop factors used for perennials are for mature crops but can be adjusted by taking into account the leaf area index or the effective area of shade, which influences water requirements. Crop factors have been adapted from references included at the end of the further info section. Campbell-Clause J. 1990. Irrigating table grapes. W.A.D.A. Farmnote No. 99/90. Doorenbos J. and Pruitt W.O. 1977. Guidelines for predicting crop water requirements. F.A.O. Irrigation and Drainage Paper No. 24. George P.R. and Cripps J.E.L. 1985. Watering requirements of vegetables grown on sandy soils. W.A.D.A. Farmnote no. 102/85. Holden, J.R and McGuire, P.J. 2010. Irrigation of Sugar Cane Manual. BSES Limited Publication MN10004. NORpak. 2007. Cotton Production and Management guidelines for the Ord Rover Irrigation Area (ORIA) complied by Yeates, S., Strickland, G., Moulden, J. and Davies, A.
Wilk, P., Carruthers, G., Mansfield, C. and Hood, V. 2009. Irrigation and soil moisture monitoring in blueberries. NSW Department of Primary Industries Primefact 827. For details on how effective evaporation has been calculated see the evaporation and rainfall section under How the Calculator estimates water requirement. A crop factor is the proportion of evaporation replacement required to be applied to meet the plant water requirements at a stage of growth. For further details on evaporation based scheduling follow the link in the see also section. Effective evaporation calculated for coarse sand and other soils. Crop Factors for annual crops. Note. Crops grown on coarse sandy soils of the Swan Coastal Plain have had a soil inefficiency factor that increases the crop factor by 0.2. For example, 0.6 would become 0.8 on these sand. Crop Factors for perenial crops. The Irrigation Calculator provides broad guidance only as to water requirements of commercial crops produced in Western Australia. It uses average weather data from the past 25 years (1990-2014) to estimate ‘effective evaporation’. It does not adjust estimates for local conditions or years that are hotter, drier, cooler or wetter than average, or allow for extra water required for frost control, preventing erosion & sandblasting, cooling a crop or applying nutrients through irrigation. These excluded factors will differ for each farm, & should be allowed for by users of the Calculator in reliance on information available elsewhere. The Calculator is not designed to assist daily irrigation scheduling, & should not be used for that purpose. The Chief Executive Officer of the Department of Agriculture and Food & the State of Western Australia & their employees & agents (collectively & individually referred to below as DAFWA) accept no liability whatsoever, by reason of negligence or otherwise, arising from any use of or reliance on the Irrigation Calculator or any error, inaccuracy or omission in its results or the data it uses. Although DAFWA has taken reasonable care to use accurate data and have the Irrigation Calculator produce reasonable estimates of water requirements, DAFWA makes no representations or warranties about the accuracy, reliability or suitability for any purpose of the Irrigation Calculator or its results.